Singapore: The fallout from the collapse of MF Global Holdings Ltd rippled through global exchanges on Tuesday, as operators moved to suspend the US futures broker or limit trades of its customers. 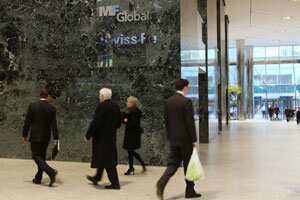 MF Global filed for bankruptcy protection on Monday following bad bets on euro zone debt. MF Global became the most high-profile victim so far of the euro zone debt crisis, and revived memories of the collapse of Lehman Brothers in 2008 that triggered turmoil in global financial markets. But market participants said because MF Global, although highly leveraged, was far smaller -- its balance sheet, at $41 billion, was less than a 10th the size of Lehman’s -- the wider impact of its fall would be contained. “While this is no Lehman Brothers, people will get more cautious because they’re afraid there could be another MF Global," said Ang Kok Heng, who helps manage about $390 million at Phillip Capital Management in Kuala Lumpur. “When there’s a run on a broker, it may be easier for it to collapse compared with a bank. Banks get central banks guaranteeing their deposits, while brokers don’t get that kind of support." In Australia, trading in grain futures and options was suspended by bourse operator ASX Ltd on Tuesday, prompting concerns about the integrity of the country’s agricultural futures market. “We’re sitting out here with risk that we can’t cover," said Jonathan Barratt, head of Sydney-based Commodity Broking Services. The London Metal Exchange said in a statement on Tuesday it had suspended MF Global from trading with immediate effect, following a similar move by the CME Group, which operates the Chicago Mercantile Exchange, Chicago Board of Trade and New York Mercantile Exchange. On Monday, CBOE Holdings Inc said it was restricting trading by customers of MF Global to closing out their positions on its platforms, the Chicago Board Options Exchange, the C2 Options Exchange and the CBOE Futures Exchange. Trading activity in gold, crude oil and grain futures slowed to a crawl as the bankruptcy forced a chaotic scramble to untangle trading positions. MF Global brokers were barred from trading floors, according to Chicago traders. Commodities such as natural gas and crude, where MF Global had a strong presence, have been hit harder than others. One Sydney-based LME trader said MF Global’s failure could encourage more market players to use clearing houses because they offered greater protection than over-the-counter (OTC) trading. “If there are customers who are in an OTC arrangement with MF Global, and these are not cleared by a clearing house, they may be exposed," said the trader. “But we don’t know who these people are." The New York Federal Reserve terminated MF Global as one of its primary dealers and IntercontinentalExchange Inc, which operates futures exchanges in Europe and North America, Singapore Exchange Ltd and Singapore’s central bank halted the broker’s operations except for liquidations.